Trust The Septic System Professionals at B&B Pumping! Don’t trust your septic system to just anyone! Call the professionals who know how to get the job done right. At B & B Pumping, we are fast, friendly and always professional. We have been servicing septic systems for many years and our experience will help us answer any questions or address any concerns you may have. We specialize in aerobic and conventional pumping, as well as cleaning lift stations. Our goal is to make sure you are satisfied with our work. B & B Pumping is fully licensed and we serve both residential and commercial customers. When you need your septic tank serviced it is generally a critical situation, unless of course you want a flooded backyard. B&B does our best to get to your call on the same day when reasonable. We truly care about our customers and consider them family. 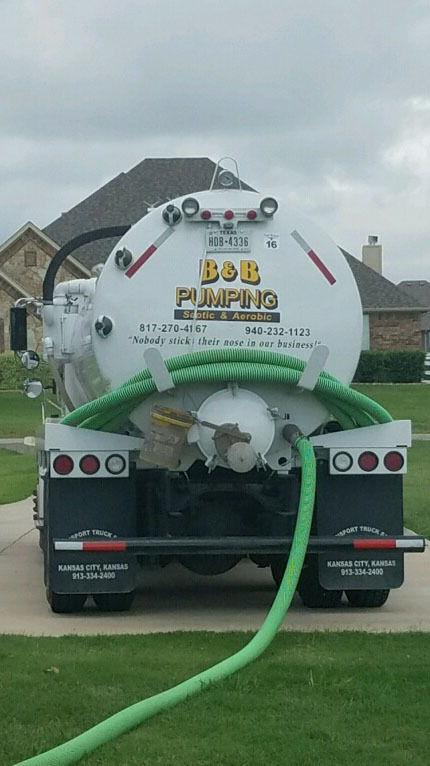 For a complete list of our septic tank services or to schedule an appointment, call B & B Pumping today at 817-270-4167 or contact us here.